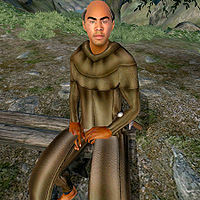 Kewan is a Redguard nightblade found at the Daedric Shrine of Peryite. When you first discover the Shrine you will find that all of the worshippers are frozen in place due to a misfired ritual to summon their lord. During Peryite's Quest, you will have to free their souls from the Realm of Peryite. In the Realm, you will find his soul wandering around near the huge bonfire in the northeastern area of the map. When approached, he will disappear. Once you have freed all worshippers from their imprisonment, you will find Kewan back at the Shrine, busy doing all of his old routines in honor of his lord; he will either preach from behind the lectern, put down an unknown offering to Peryite, sit on one of the benches or wander around. He will do this 24 hours a day, without ever eating or sleeping. Kewan wears a monk robe, is armed with an iron dagger, and carries a few coins. He knows the standard nightblade spells and additional major alteration and minor destruction spells. Peryite: Peryite wants you to enter the Realm of Peryite and rescue the souls of his worshippers from their folly. The RefID for his soul (i.e., the part of him that is trapped in Peryite's Realm) is 000E7A8D. This page was last modified on 4 January 2019, at 02:43.